Finally the time has come where every Makeup Brand comes with its own Holiday Makeup Kit. I am super excited for this Shopping Season.😉 For the whole Months of November and December I am going to review every single Holiday Kit which I buy. Again these Reviews are not similar to our regular Reviews. In these Reviews I am going to talk about the deal and will give the Idea to Buy or Not to Buy like we did last year. I will later share my thoughts for individual products reviews in our other posts as I just bought these products & have used only once till now. In today's post I am Reviewing Hello, San FrancisGLOW! 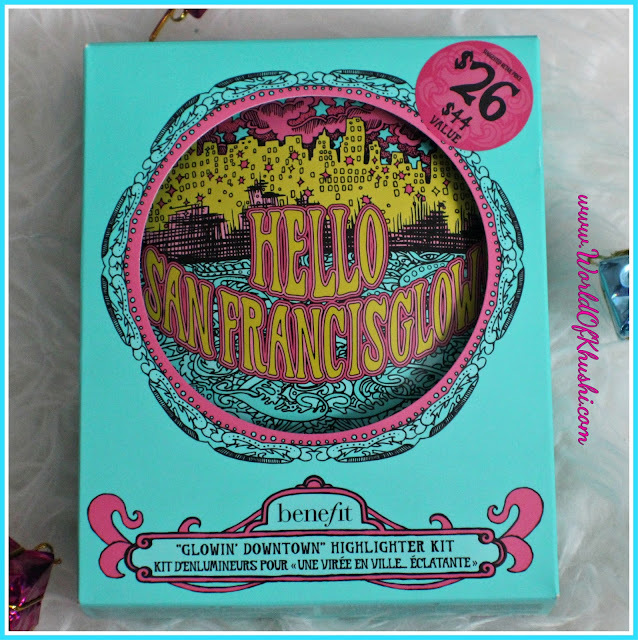 'Glowin' Downtown' Highlighter Kit which is one of the Holiday Kit by Benefit Cosmetic. When it comes to cute packaging Benefit Cosmetic is one of my favorite brand. This Kit includes 5 mini size Products. I bought this Kit from Ulta Beauty. It comes in Sea-green color with doodle and San Francisco painting all over. The Packaging is super cute, very beautiful, girly, stylish. This time they have come with San Francisco Collection so you get the feel of different areas of San Francisco with their painting and doodles. Well all I can say is that I can't resist their Packaging. Last time I got Sassy Lassie which I still use it as a display and this time also I will do the same. Again the Box is reusable where you can store your Jewelry or Makeup. It gives you 5 mini size items where 4 are Makeup Products and 1 is little Brush. This Kit is all about Glow and I love using Highlighters. I don't have any from the Benefit Cosmetics so for me it's a great deal to try out their Highlighter Range. The actual worth of all the Products is $44. From Price point it's a good deal. Plus I feel that you are getting Makeup Product as well as getting very cute Reusable Box. Price-wise I like the deal. I really like this deal. 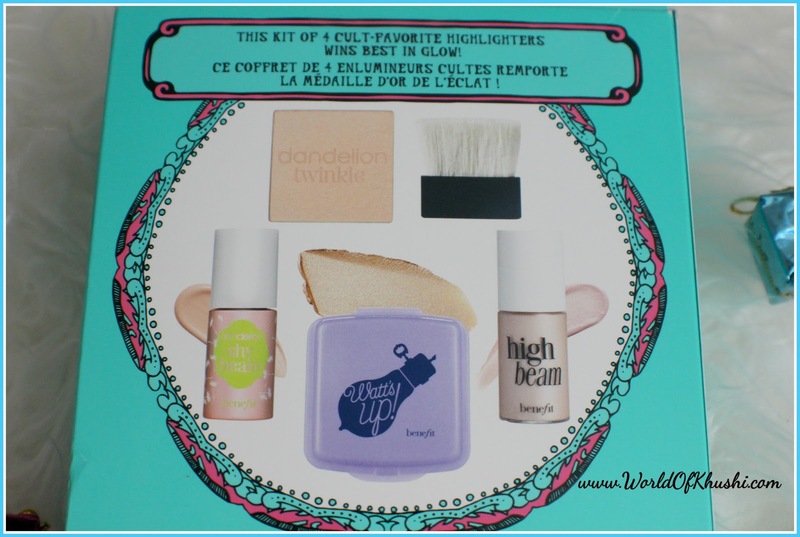 If you love Highlighters and love dewy glowing skin then this Kit is for you. Plus it's Limited Edition!! 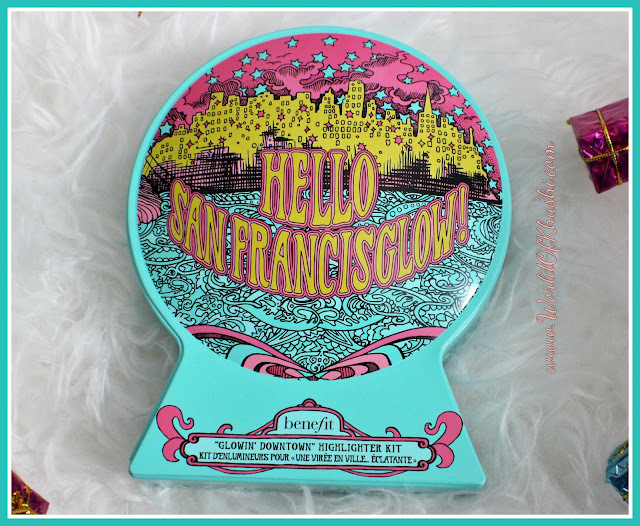 This is my very small and quick Review for Hello, San FrancisGLOW! 'Glowin' Downtown' Highlighter Kit by Benefit Cosmetic. I hope you people got some idea about this Holiday Kit. I am very excited for this Kit as I love Highlighter and love to decorate this Kit in my Beauty Room. If you guys want me to do any specific product Review of your choice, let me know!! There are many cash back websites like Ebates (US) where you will get Cash Back on your Purchase. So you can go to Ulta Beauty using this link to get even more savings. For more such Reviews stay tuned with Khushi's World. Please like and share the post. Follow me on Khushi's World Facebook Page, Google+ , Instagram and Pinterest for more Posts.I will see you in next post till then take care.